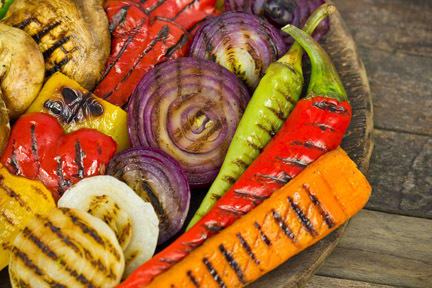 Grilled late-summer vegetables are delicious and very easy to prepare. You only need olive oil, kosher salt and your favorite vegetables. Eggplant, peppers, radicchio, tomatoes, zucchini, onions, corn, baby potatoes and summer squash are all perfectly suited for grilling. Scrub vegetables to remove any dirt, remove any labels, and then dry completely. Cut larger vegetables into medium size pieces or slices. Baste the vegetables lightly with olive oil, then salt. Grill until the vegetables are softened and browned on all sides, about 5-7 minutes. (Potatoes and corn may take slightly longer.) Then prepare one (or all three!) of our delicious sauces below. Using the ingredients listed for each recipe below, simply combine in a small bowl, mix well, and refrigerate until ready to use. Serve over grilled vegetables or on the side as a dipping sauce.